The girls and I have been seeing a lot more frogs and toads up close recently when we’ve been doing our nature walks and working in the flower garden. It’s been interesting to see a variety of frogs and toads, and to compare pictures I’ve taken with those on the internet to determine the type of amphibian we saw. 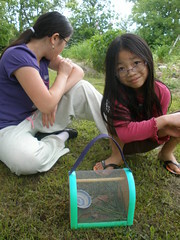 Olivia showing the Wood Frog that she and Sophia captured. that we were working on. The girls were excited to be able to observe the Wood Frog up close and create a temporary home for it in the wire and wood carrier. Wood Frog that the girls captured and released. In the evening earlier this week, we were working in the flower garden. All of a sudden there was movement to the right of where we were working. Looked closer and there was an American Toad trying to blend in with the stone. 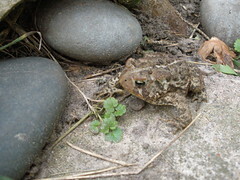 American Toad found in the flower garden. The American Toad is easily recognizable by the line going down its back. It will be near ponds and water in early spring, but then spends the rest of the season in drier areas. They hibernate by burrowing backwards into the ground, and do so with other American Toads. They spend the winter several feet below the ground. 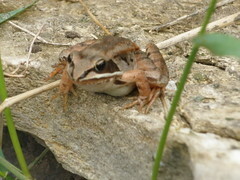 Another amphibian that we saw while we were on a nature walk was the Northern Leopard Frog. This one was rather large compared to other frogs that we’ve seen here. It also jumped pretty high which was startling…especially when leaning in to get a closer picture. 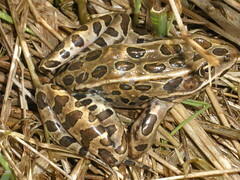 Northern Leopard Frog by the edge of the pond. We’re going to continue to look for more frogs and toads here, and hopefully be able to add some different names to the list throughout the summer.